"Arthur Penn's Night Moves is about an old-fashioned private eye who says and does all the expected things while surrounded by a plot he completely fails to understand." "Harry Moseby is played by Gene Hackman as a man who, in 1975 Los Angeles, still seems to be taking his cues from old film noir movies. The glass on his office door says: Moseby, Confidential ... and there is an understated romanticism in that curt wording that fits with his battered desk and the arched window that looks down, no doubt, on mean streets. His wife is always after him to join a big detective agency and enter the modern world, but he likes the life of a free-lancer, tooling around in his aging Mustang, jotting down license plate numbers in his little spiral notebook." "It is probably true that if you saw 'Night Moves' several times and took careful notes, you could reconstruct exactly what happens in the movie, but that might be missing the point. I saw it a week ago with an audience at that holy place of the cinema, George Eastman House in Rochester, N.Y., and then I was joined in a discussion with Jim Healy, the assistant curator -- we talked for an hour with a room full of moviegoers and we were left with more questions than we started with." "Of course, we could fall back on the old filmcrit ploy, 'we're not supposed to understand the plot.' That worked for 'Syriana.' 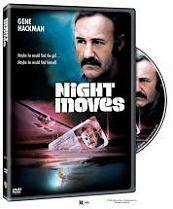 But in 'Night Moves,' I think it's a little trickier. The plot can be understood, but not easily, and not on first viewing, and besides, the point is that Moseby is as lost as we are. Something is always turning up to force him to revise everything he thought he knew, and then at the end of the film he has to revise everything again..."
Vintage featurette: "The Day of the Director"